Stovall was a sportswriter for the Brownwood Bulletin from 1958-1996. A native of Brownwood and a 1960 graduate of Howard Payne, Stovall began working for the Bulletin part-time in 1958. In 1960 he was named sports editor -- the same year that coaches Gordon Wood and Morris Southall arrived in Brownwood. With his customary unlit cigar, Stovall attended 439 consecutive Brownwood football games. His “Points After” column documented Brownwood’s seven state championships as well as many other high school games in Central Texas. In 1967 he was named Sportswriter of the Year by the Lone Star Conference for his coverage of Howard Payne and the Lone Star Conference. Stovall was known for his encyclopedic knowledge of Texas high school football and the objectivity and fairness of his columns. 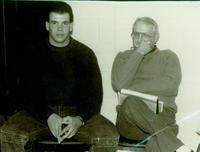 Stovall received the Sportswriter of the Year Award in 1977 and 1990 from the Texas High School Coaches Association. 1108 S. University Parks Dr.